My kids arrive home from school absolutely ravenous, and I want to give them something that will satisfy their appetites, fuel their bodies, and provide enough energy so they can dive into homework, all without ruining their dinner. 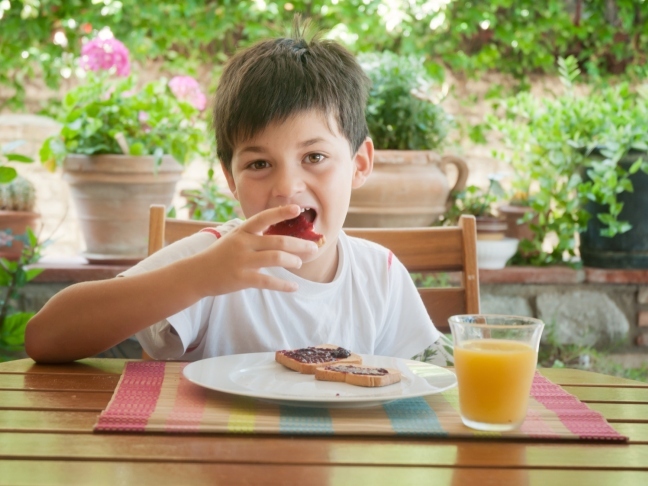 Check out these quick 'n easy after-school snack ideas that give little minds and bodies a much-needed boost! Simply serve your kids apple slices on a plate alongside a dollop of almond or peanut butter. Either let your children dip the apple slices into the nut butter, or give them a plastic knife so they can spread the nut butter onto the slices themselves. A low-sugar, all natural store-bought fruit leather makes a wonderful treat for kids. Give your children a slice along with a handful of walnuts for a nutrient-rich snack. Layer plain Greek-style yogurt with granola and a drizzle of honey (or agave nectar) for a two-minute snack that's sure to please your little guys. Keep a few peeled bananas in the freezer. When your kids come home, melt dark chocolate in the microwave and dip the frozen bananas in the chocolate. Roll the chocolate bananas through some crushed nuts, if desired. Presto! You have a healthier alternative to a popsicle. Spear cubes of your child's favorite fruit onto a wooden skewer. Choose colorful fruit so you have pretty kabobs. If you are feeding younger children, snip off the pointy ends of the kabobs. A full smoothy can ruin dinner, but a small smoothie (about half a pint) is just enough to satisfy immediate hunger needs. Make yours by blending 1 cup low-fat plain yogurt with 1/4 cup berries, 1 teaspoon honey, and a pinch of cinnamon. Whiz together and serve! Slice carrots, celery, and cucumbers into long crudite and serve with a bowl of protein-rich hummus. You've got a super semi-homemade snack! What's GORP? Good 'ole raisins and peanuts! Essentially, this is a trail mix you can customize to suit the tastes of your children. Get creative with dried fruits, nuts, and even veggie chips. Slice a few celery staks so you are left with long 4 – 6 inch pieces. Fill the hollow well of the celery stalk with peanut butter and embed raisins into the peanut butter, so you have a delicious snack that looks like little creepy crawlies are taking over mealtime! Popcorn may have a bad rap as junk food, but, in fact, it's a whole grain, and when served without butter or tons of salt (and eaten in moderation) it can be a healthy snack option. Get creative with your popcorn by mixing it with nuts and raisins. Serve small portions to your kids.